The Second Vatican Council was supposed to usher in a time of hope and joy, a new Pentecost for Church. Instead, the Church was seemingly caught flat-footed by the enormous social and cultural upheavals of the late 1960’s. By 1972, Pope Paul VI was warning ominously that, “From some fissure the smoke of Satan has entered the temple of God.” At the time of Pope Paul’s death, it had been more than a decade since the last papal encyclical—not since his prophetic Humanae Vitae had been met with widespread contempt and dissent in the summer of 1968. Then, Paul VI’s successor, John Paul I, died suddenly after only 33 days in office. 1. In a time of trouble, John Paul II reminded the Church to “Be not afraid!” As we’ve already mentioned, the Church was in turmoil in 1978. John Paul II’s pontificate was like a splint applied to a fractured leg: he provided stability so the wounded limb could heal. This was accomplished partly through his personal charisma, and partly by the mere fact of his longevity, but mostly it was through his extensive magisterium. The definitive interpretation of Vatican II that he provided allowed the Church to move out of a time of deep crisis and into a position better suited to evangelization. 2. John Paul II gave us the Catechism of the Catholic Church. The last universal catechism had come out of the Council of Trent in the sixteenth century. Want a well-formed conscience? The Catechism is a powerful tool for learning (and relearning) what the Church teaches and why. And it’s available for free, online. 3. John Paul II’s legacy also apparent in the complementary papacies of his two successors: Popes Benedict XVI and Francis. Now, this isn’t a game of “give JP2 credit for everything.” Both Benedict and Francis are their own men with their own strengths and weaknesses. Nevertheless, John Paul II did make Josef Ratzinger one of his chief theological allies, and pulled Jorge Bergoglio from provincial obscurity to make him an archbishop and, eventually, a Cardinal. Much is made of the differences between these three popes, but it is hard to imagine the election of Benedict XVI without his long and fruitful collaboration with John Paul II. As for Pope Francis, it’s easier to share his confidence that the Church can withstand a little “mess” from time to time when one recalls the bulwark of orthodoxy provided by the teachings of his two immediate predecessors. Francis can be Francis in part because John Paul II (and Benedict XVI) were the popes they were. 4. A fourth legacy of the Polish Pope is his rich anthropology and personalism that made him a true champion of the dignity of the human person. John Paul’s taught a whole generation what it meant to contemplate the dignity of the human person in the light of the mystery of the Incarnation. This was an important theme of Vatican II’s Gaudium et Spes–in part because Bishop Karol Wojty?a helped develop it there. Human dignity formed the underpinning of his defense of human life and the family, his social teaching, and his theology of the body, which, it must be noted, is about much more than sexuality. It is about what it means to be embodied creatures, and what that reveals to us about the One who, not only gave us our nature, but who took it on in the Incarnation. Thus, his first encyclical was called Redemptor hominis (Redeemer of man) and his second, Dives in misericordia (Rich in mercy). 5. Speaking of mercy, John Paul II was the pope of Divine Mercy. Not only did he popularize (and canonize) St. Faustina and the Divine Mercy Chaplet, he lived the same message in his own life. This was shown most poignantly in his begging forgiveness for past sins committed in the name of the Church and in his forgiveness of the man who shot and nearly killed him, Mehmet Ali Agca. Of course, he also dedicated the Sunday after Easter as Divine Mercy Sunday, a decision that was ratified in the minds of many of the faithful when he was called home the House of the Father on the eve of Divine Mercy Sunday. 6. The Pope Who Helped Win the Cold War: It is easy to look back at the history of the late 20th century with the perspective of inevitability that comes with hindsight. But the fact remains that the way the Cold War ended was not just unlikely, but positively miraculous. Many factors played into the fall of European communism, including, of course, politics and economics. But it was John Paul’s insight into history’s moral, culture, and religious undercurrents which proved decisive in the speed and peacefulness with which that victory over totalitarianism was won. 7. John Paul II made important contributions to the Church’s social teaching. His insistence that culture, more than politics or economics, drives human history, enabled him to articulate devastating and effective critiques of Socialism. That same insight makes his social magisterium a critical resource for diagnosing and combating the challenges of our own day. Freedom untethered from truth, he warned, threatens to transform democracy into thinly disguised totalitarianism. And when economic structures place private gain above the common good, human flourishing is endangered. 8. John Paul II gave us World Youth Day. For millions of young people World Youth Day served as a powerful reminded that they are not alone. One cannot stand in a field with 2 million young people from around the world (as I had the chance to do in Rome in 2000) and not feel the catholicity and vitality of the Church. John Paul’s challenge to the young—never settle for settle for less than the full dignity of your vocation as children of God—was a bracing contrast to a world that promised cynicism, compromise, and comfort-seeking. 9. John Paul II’s appeal to the young also helped spark a renewal of the priesthood. While there were fewer priests in the world in 2005 (406,411) than in 1980 (413,600), this same era was marked by an increase in new vocations to the priesthood. In 1980, there were 33,731 seminarians in the world. By 2005, that number had climbed to 58,538. Over the same time period, ordinations of diocesan priests rose from 3,860 to 6,614. [All numbers are from CARA, here.] Many young priests and seminarians from all over the world will tell you: the exemplary way Pope John Paul lived his priesthood played a decisive role in their own vocational discernment. 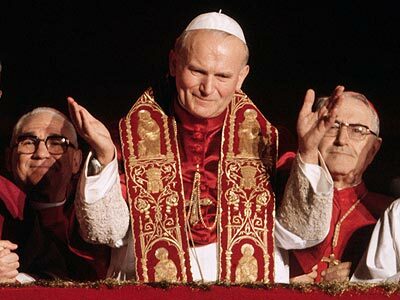 By becoming transparent to Christ, John Paul II became a living witness to untold millions of the light of the Risen Christ: in his vitality and charisma, in his confidence and passion, in his humility and piety, in his willingness to defend the weak and his eagerness to forgive, and in his last days especially, in his willingness to join his sufferings to the sufferings of Christ. John Paul II was a witness to the peace and joy that come from knowing the God who came that we might have life, and have it in abundance.